Get a raptor take off rear axle. Or get a custom 9" built but that's gunna get pricey quick. I've already got an OEM 4.10 in the rear so would that make the swap easier? Or does that even matter at all lol What kind of damage am I looking at for an install? That means you just bolt it in, hook up the brake lines and abs sensors and hit the road. I've seen stockers go for as low as 1k and you can recoup some of that by selling your assembly. IIRC the raptor unit is 3" wider per side. Thank you, ill be on the look out then! 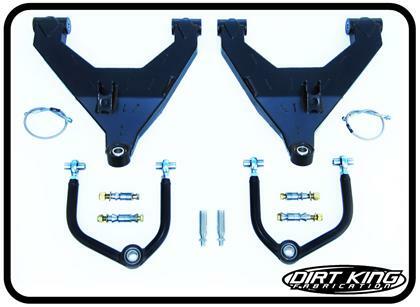 Here are a couple examples of what's out there to upgrade your front suspension (all are MT or sub 17"). Even though the RPG and Camburg kit are marketed toward the Raptor, they will absolutely bolt on to a non-Raptor (09-up) and can be used on 04-08 with some minor modifications. Keep in mind, both the RPG and Camburg lowers can be ordered as a single or dual setup - meaning run 1 or 2 shocks per side up front (1 coilover or 1 coilover & 1 bypass). You will need longer tie rods and brake lines if adding these to a non-Raptor and longer axle shafts if you have 4wd. 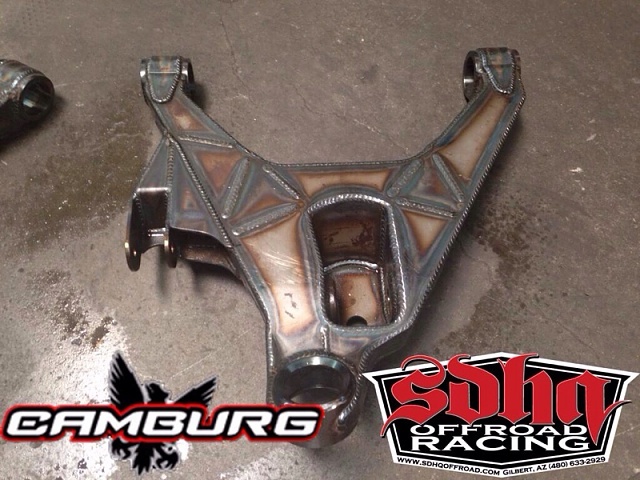 here is a Camburg lower as well... This is what's on my Raptor but I have the dual version (same but with provision for another bypass). to restate my post earlier - setting up the rear is relatively easy - Deaver or National springs, LT shackles, a bump kit and some bypass shocks and you are pulling 16+ inches (mine is strapped at 16 to be safe and allow for strap stretch). Maybe you can help me out with a few additional questions i have that others may have as well. My dilemma is that i don't want to go over the stock Raptor 73.6" width in the front. Even with just the offset of rims i have now this truck feels WIDE so i really don't want to be going 5-6" wider per side like some kits have. I think this limits me to RPG, Dirt King, and maybe Camburg? With that info, as far as the front goes, can you let us know more about the Camburg kit? What kind of travel numbers are those of us with already upgraded UCA's looking at in the front? Am i really at much of a disadvantage by going with a kit that fits my current 2.5's vs upgrading to 3.0's in the front? As far as the rear goes I've seen that adding LT shackles will actually lower the rear end by and inch or so? They are actually a reasonably priced item but how could i keep the rear level with the front without using blocks? I have a Deaver +2 Raptor Mini Pack on its way and was wondering what your honest opinion of doing a +3 Pack and then adding the LT Shackles so it evens it out? Is this even worth doing with 2.5's in the rear like i have now? If i go 3.0 will these simply bolt up using my current mounts? Can i run 2.5's up front and 3.0's in the rear until i save up enough for a full front end conversion? Im really sorry about the myriad of questions i just threw at you but I've been stumped on these questions for quite some time now and can't decide or find the info. Im not doing as much high speed desert running as i used to but i still hit the trails at least once a week for my "Sunday Drive" and would appreciate a little more travel to take on the trails. Last edited by Eco-BEAST 28; 02-10-2014 at 10:17 PM. Last edited by WarSurfer; 02-11-2014 at 01:18 PM.